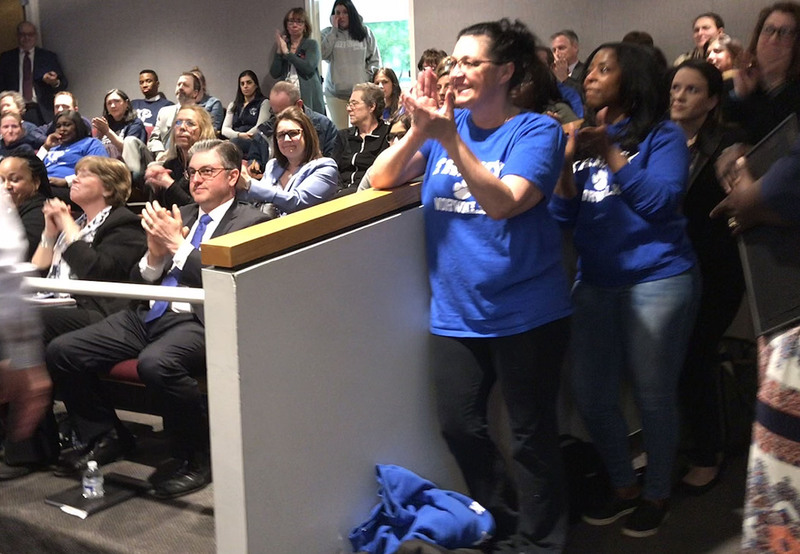 Attendees of Tuesday’s Norwalk Board of Education meeting applaud Rowayton Elementary School leaders and their second recognition as a School of Distinction. NORWALK, Conn. – Board of Education members on Tuesday emphasized the positive with a presentation that drew multiple rounds of applause from a full Common Council chambers. Highlighted were Saturday’s surprising Norwalk High School girls’ basketball state championship and other high school athletic champions, along with schools which earned School of Distinction awards. “What a thriller,” Norwalk Superintendent of Schools Steven Adamowski said of Saturday’s come-from-behind basketball win at Mohegan Sun. Adamowski noted that the Norwalk Lady Bears beat New London in the last minute of the game. Naeva Rene scored the winning points, WTNH reports. Adamowski and NPS Chief of School Operations Frank Costanzo attended the game, part of “a lot of support from the City of Norwalk, which was awesome,” Penn-Williams said. A celebration for the families is planned for April 7, NPS is buying the girls championship rings and there will be an athletic banquet in May at the Norwalk Inn, he said. In another first, NPS is “acquiring and building a float” for the Memorial Day parade, he said. The award-winning Norwalk High School Marching Band will lead the float and Norwalk’s high-achieving athletes will be on it: the basketball girls; Brien McMahon senior Justin Ford, who is ranked number one in the country in triple jump; State diving champion Kevin Bradley; and wrestling 120-pound champion Sam White. Mayor Harry Rilling has donated $500 in Mayor’s Ball proceeds to assist in the expenses, Adamowski said. Diane Peters, a public speaker, said the Lady Bears basketball players have an average 3.4 grade point average, a first for the City. All three seniors on the team are college-bound, and two are going just on the strength of their grades, Carolyn Fuller said. Their mentors are all products of Norwalk Public Schools, including their coach and her son, Richard Fuller Jr.
Board Members also recognized the district’s School of Distinction winners, in a follow-up to the review of the Next Generation Accountability report made at the last BoE meeting, this time featuring the staff and parents involved. The “Distinction” moniker was bestowed on 160 schools statewide “because they have a high overall academic performance, or are among the schools with the highest rate of academic growth for all students or for students with high needs,” according to the CT Mirror. “We are really happy about it because it’s a public affirmation for what we know to be true of our school. It is a good place for students to learn,” Rowayton Elementary School Principal Joe Rodriguez said. “We all believe that every child who enters our building is not defined by their challenges, they are not defined by their circumstances or their demographics or their zip code, they are defined by their potential and the innovation that all of them have,” Kendall Elementary School Principal Zakiyyah Baker said. Jefferson Elementary School Principal Nicholas Brophy spoke of the “strong focus” his staff members have as they pride themselves in excellence. “I see this on every grade level,” he said. I would like to take this opportunity to thank the entire Norwalk community for their support of our Athletic program, our athletes, and specifically our girl’s basketball team. The support this team received from the Norwalk community — fans, alumni, faculty, staff, Board of Education members, the City of Norwalk and Mayor Harry Rilling — has been exceptional throughout this championship run. I would also like to congratulate our coaching staff — Rick Fuller, Evan Kelley, and Karey Fitzgerald, for their hard work, leadership, and dedication to this exceptional group of young ladies. They have been an inspiration on the basketball court, as well as in the classroom. They have made the City and Norwalk High School proud! GO BEARS! 7. Approval of a number of budget transfers and the monthly financial report. As the above story indicates, it was indeed a positive meeting. Yes —it was a very positive meeting and it feels great! We have some superstar basketball players to celebrate and lots of wonderful work going on in our schools. Thanks to the BoE and NPS staff for all their hard work! Congrats to the basketball team! GO BEARS!!!! Our BOE continues to set the standard for public service in Norwalk. Kudos. What’s happening over in the Common Council ? Awfully quiet. Election year ? Why BoE takes the praise? The success should go to the kids NOT the BOE. But can our $14,000/yr students write longhand as we all learned by the 3rd grade? That’s really not too much to ask.